This will be a smorgasbord of ideas all rolled into one post. Yes, I know, it's almost Thanksgiving now... and there's no way you could possibly use this idea this year...but I thought I'd share because I really liked it. Maybe you can tuck it away for next year. I found some word family turkeys last year on a blog. I loved them, but they were designed to practice long vowels. Since we're just now wrapping up short vowels I created some new turkeys to use as a short vowel review. My kids loved them. This project was one of their reading tubs a few weeks ago. Each child chose one turkey (each with a different word family) and six feathers. They wrote words for their word family on the feathers, colored, cut, glued, and voila...word family turkeys. Moving on to Reindeer... because Christmas is right around the corner. Now, I'm not one of those Christmas fanatics who puts up Christmas decorations the second week of November. But-- I do like to do these reindeer during the first few days of December so we can use them all month. I call them Reindeer Mail. I send home a letter to the parents requesting that they send in a small item (candy, Christmas pencil, small notebook, other junk from the Dollar Store) for the reindeer pockets. The children also spend a little time each day writing a note to each child in the class. For the notes, or Reindeer Mail, I tell the children who we are going to write a note to for that particular day. Within 17 days we have a note for each child. When I pick your name, you get to write a note to me :) By the time our Christmas party rolls around each child has a reindeer pocket full of little treats and special notes. We open them on the day of our party. Each first grade teacher does this and we all use our bulletin board outside the room to hang the reindeer. The kids are so excited to see what's inside. Since I'm obviously not good at blogging each day-- or each week-- I'll share another idea. This is one of my favorites! Each year my kids make Christmas books for their parents. After doing the planning page, they write the words in their book. I type out the sentence frame, copy onto 3.5 X 5" labels, and stick in their books ahead of time. Then for the next 10 days, the kids illustrate one page a day. I buy them the 64 count box of crayons to use for the second semester of school (because the 24 count is all yucky by this point). They LOVE all the color choices and always do a really nice job illustrating. We also decorate the cover and dedication page. Lastly, I have each child sit with me and I type the About the Author info (I've found this is so much faster than having each child write it themselves, bring it to me, and then try to decipher their writing). I also take a picture of them with a Santa hat to put on the About the Author page. We spend a little time wrapping them in class (which is a hoot, because none know how to wrap). Then they go home as a present for their families. Most years I have one child who doesn't celebrate Christmas. They will do a book called "My Family." Their sentence frame says "My family _______." This book is much harder for the kids to write, but it still works fairly well. 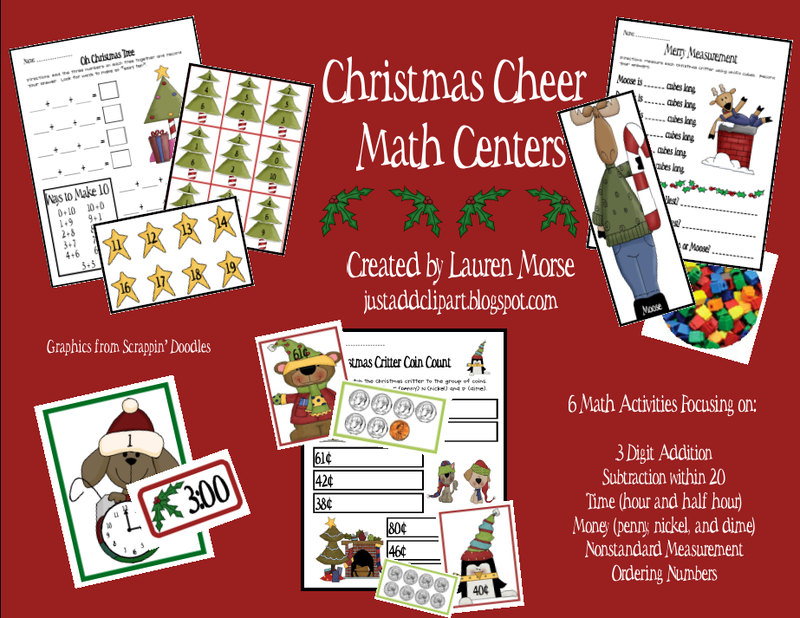 I've created some Christmas Math Centers. You can find them in my TPT store for just $5. These activities were made to cover Core Curriculum content for "real classrooms." My kids will be using them the next three weeks in their math tubs. If you check them out, or purchase them, I'd love to know what you think. I'm your newest follower! Your raindeers came out so cute! So cute!! Love those turkeys!